Lisa Stohr Berkshire County Animals & Nature Activities, Enjoy the Outdoors with your Family! Balance Rock - Pittsfield State Forest, Pittsfield MA Amazing, huge 165-ton limestone boulder balanced precariously upon bedrock, a natural curiosity. A Berkshire County 'must see'! Hike the many wooded trails, ATVs and OHMs allowed w/permit. Bartholomew's Cobble, Weatogue Rd, Sheffield MA 01257 413/229-8600 MA Tour the cobbles, trees, understory plants & river on the Ledges Trail, which also passes two small caves kids love to explore! You can also trek through open fields, transitional forest, and freshwater marshes with beaver ponds along the Cobble's other trails. Mix natural history with some cultural history: follow the trail that leads to the nearby historic Ashley House, from where enslaved African American Mum Bett (Elizabeth Freeman) sued for her freedom and won.... helping to end slavery in Massachusetts. Natural History Museum and Visitor Center. Bartlett's Apple Orchard 575 Swamp Road, Richmond MA 413/698-2559 - New England gourmet farm products & handmade apple gift boxes. "The Best Apple Picking in Massachusetts", (from Labor Day to Columbus Day). A great place to visit on autumn foliage trips, New England family vacations or New England weekend getaways! Schedule a tour of the orchards! Open 7 days 8 to 5:30. Berkshire County Farmer's Markets and Roadside Stands - The next best thing to picking your own! Find fresh produce, flowers, delicious baked goods and more! Berkshire Horseback Adventures, Aspinwall Equestrian Center - Rte 7, Lenox MA - An array of horseback riding options, from one hour pleasure rides to overnight camping trips. Bring your sense of adventure! Guided Trail rides with Professional Horsemen. Berkshire Humane Society Helping Animals and People since 1992." 214 Barker Road, Pittsfield MA 413/447-7878 - Visit the shelter, pet and walk the animals awaiting permanent homes. FREE! Berkshire Mountain Llama Hike - "...a beautiful place to relax, restore and return to nature!" 322 Lander Road, Lee, MA - 413/ 243-2224 - Llama hikes, Meditation Retreats & Training, beautiful B&B lodging. Peaceful and quiet beautiful Berkshire farm with sheep, bees and large organic fruit / vegetable garden. Eleanor Sonsini Animal Shelter "Volunteers are essential to the success of any animal shelter." Downing Industrial Park, Pittsfield MA 413/448-9800 - Walk, cuddle, groom and play with the animals awaiting homes. FREE! Furnace Brook Winery at Hilltop Orchards Rt. 295 / 508 Canaan Rd., Richmond, MA 413/698-3301 - 100 year-old farm set on 200 scenic acres in the Berkshires. Stroll about the apple orchards, or hike, ski or snow shoe the private back country trails. Apple picking, Hay rides, Free wine tasting. Green River Farms, 2480 Green River Rd., Williamstown MA 413/458-2470 - Pick your own strawberries, blueberries, garden veggies and pumpkins during the harvest season. LOTS of animals at our petting zoo! Wagon Rides, Pony Rides on weekends! Open DAILY til 7pm. Hancock Shaker Village "The City of Peace." - a retreat from today's hectic pace." Route 20 & 41 Pittsfield MA 413/443-0188 - Restored 18th Century Shaker village preserves a simple, peaceful, efficient life-style. Animal farm, tours, museum, hands-on activities. Gardens, hiking trails, Cafe, Gift Shop. High Lawn Farm Summer St., Lee MA 413/243-0672 - The last remaining complete dairy farm in the Berkshires - producing, bottling & delivering its own milk - for over 100 years. Call to schedule a FUN tour for your family! MA Audubon Pleasant Valley Wildlife Sanctuary"Protecting the Nature of Massachusetts." 472 West Mountain Road, Lenox MA 413/637-0320 - Walk 7 miles of trails, visit the nature center, bring a picnic lunch! Nominal Admission Fee. Uncle Don's Barnyard - Ioka Valley Farm 3475 Route 43, Hancock MA 413/ 738-5915 - Unique farm experience for the whole family! Friendly farm animals to pet & feed. Wagon train ride, pedal carts, pipeline slide, hay tunnel! Undermountain Farm Horseback Riding "Year-round riding is a pleasure at Undermountain Farm." Undermountain Road, Lenox MA 413/637-3365 - 150 miles of pasture, indoor and outdoor arenas. Trail Rides/Lessons/Pony Rides $20-$60/person. 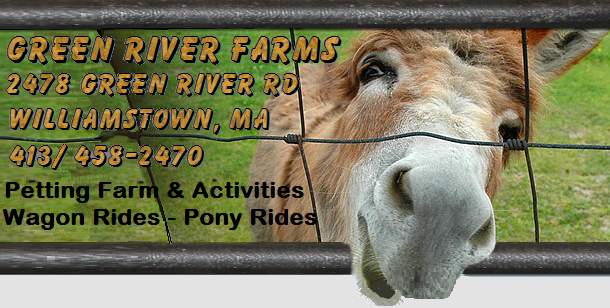 Whitney's Farm Market & Garden Center Rte 8, Cheshire MA 413/442-4749 - Farm & garden center with a Petting zoo! Windy Hill Farm Rte 7, Great Barrington 413/ 298-3217 - 7 acre apple orchard, a 1 acre blueberry field - bring the family and pick your own! Very informative article on how to keep your dog at your side ... no more bolting away! In a matter of no time, with just a little patience, this training routine will help keep your dog from running off or away. Hiking trails to Race Brook Falls and beyond are only steps away from your accommodations in the lodge, cottage, or coach house. 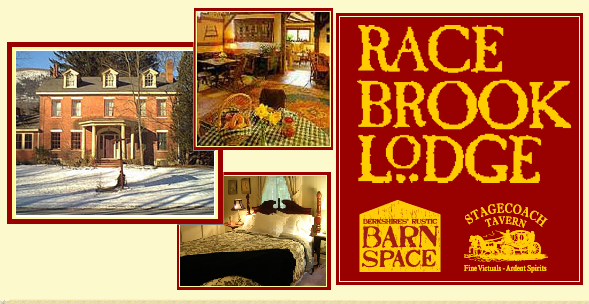 Low keyed, informal rustic retreat, the perfect place to relax in a scenic Berkshire country setting. ▸ Restaurant ▸ Pool ▸ Wireless Internet on site. Help us collect important data by participating in Mass Audubon Bird Monitoring Programs (including the Oriole Project, the Whip-poor-will Survey, the second statewide Breeding Bird Atlas), or our sanctuary breeding bird surveys. Get involved in the annual Christmas Bird Count or our Annual Bird-a-thon! TUE - SUN | 7am - dusk. Every Friday AT 11am, toddlers can enjoy meeting different species of Marine Life in our aquarium & observe aquarium feeding time! Program also features Story Time. of FUN things to do as a Family! Get Listed Here - FREE!